Message From the Cap’n is a compilation of history, fishing advice, waterman and weather insights, Chesapeake lore, and ordinary malarkey from the folks who keep their feet wet in the Potomac and St. Mary’s rivers. 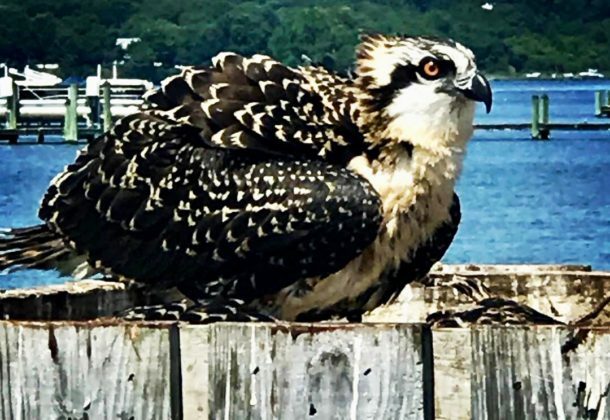 This month’s highlight: The Ospreys return! We are nearing the last week of July in the St. Mary’s/ Lower Potomac and the water temperature is hovering at 80 degrees Fahrenheit. The Interpretive Buoy System‘s report of 11 parts per unit (PPU) salinity is going to fall with our rain gauge topping out at 5″ of rain over the last 2 days. 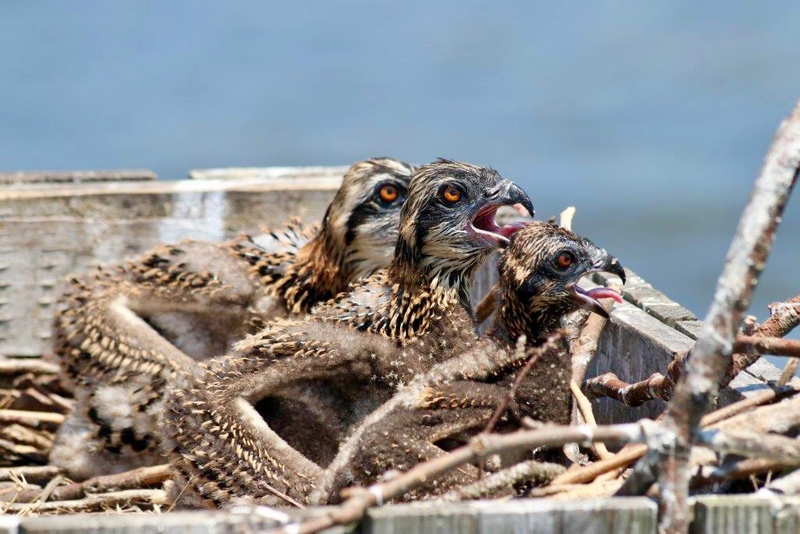 Most Osprey nests produce from two to three birds. Both parents are kept busy feeding the babies and there is plenty of fish for food. Most Osprey young are on the wing by now. feeding themselves, and venturing out in unchartered territory in the Chesapeake Bay. The young birds learn to fish and provide for themselves before being left behind in September as the adult birds start their southern migration down the 77th parallel to South America. In October the youngsters join the stream of other migrating Ospreys going south to overwinter. Ospreys have “nest site fidelity.” Pairs reunite each spring at their nest, but do not overwinter together. The young return to the area in which they were born to start new nests. Plenty of Bottle-nose Dolphins are venturing into St. George creek to feed as witnessed by the video from Shane Ross of Piney Point, MD. And the gymnastics prize goes to….these dolphins! Dolphins are very social animals and these side slaps and back flips are some of the ways they interact with each other. Thank you to Shane Ross for this fantastic video taken in St. George Creek, Maryland. Bottom fishing has been poor this season with no Spot fish at all to catch. Hard head or Croaker have been extremely scarce also in the Lower Potomac. Salinity has been down to 9 PPU which is not conducive to the habitat for these fish. With this much rainfall over the past few days it is going to stay down for a while. BTW; there are no stinging nettles showing up in our local waters yet as they need salinity to flourish. The Blue Crab season got off to a slow start but has been good up until now. Catches have been decent with prices averaging close to $100 per bushel for good culled males ( 5 3/4″ and up). Recreational and charter fishermen: sign up for a fishing report from the Tackle Box. Ken Lamb has a good read on fishing in the Lower bay, Potomac and Patuxent rivers. To learn about tours and trips into the Chesapeake get more information on Fins + Claws’ Leader Member Page. Jack, we are back home in Naples. Extremely warm. While we were up there we had crabs several times. Really good and fat however never did see any of those $100 bushels. More like $200 or $50 a dz in the restaurants.